“The Meddling Shogi Player” is one of IDAC’s more challenging games, so don’t be ashamed if you get stuck. I’ve written a walkthrough for anyone who needs help with it. 1. Open the book on the shelf next to the globe and take the handkerchief. 2. Pick up the “Kaku” piece from next to the globe. 3. Zoom out, then tap on the cabinet below the globe. Above the combination lock is a small piece of tape. Take it. 4. Turn right and zoom in on the mirror. Tap near the bottom and take the mirror shard. 5. Zoom back out, then open the fridge. You can now see the shaft of a screwdriver underneath the fridge. Take it. 6. Zoom in ok the table upwards the back. There’s a game board with the letter “B” written next to it. There’s also a small box. Open it and move the tiles out of the way to get the faucet handle. 7. Go to the sink and attach the handle to the faucet. 8. Turn back to the tables. There is spilled coffee on one of them. Place the handkerchief by the coffee. Then place the stained Kaku piece on the handkerchief. We’ll come back to this later. 9. Zoom in on the game board that says “C.” There is a blue clock next to it. Place the piece of tape over the right screen. We’ll need this later. 10. Turn to the screen with the blackboard. On the right side of the board is an “Osho” piece that can be removed. Take it. 11. Zoom in on the chair by the desk. Someone locked a cup to it with a bike lock! Zoom in on the lock combination. Tap on the letters “ABCD”. This is the clue to opening the lock. A: The piece on there is a Hisha piece. Look at the blackboard and tap on the Hisha drawing. You can see that it moves only left and right and up and down. Since it is in the upper right corner, it can only move left and down. If you trace this path, it makes up the number “7”. This is the first number of the bike lock combination. B: The piece here is a “Kyosha”. If you look a the blackboard, you can see it only moves up. If you trace its path on the board, you get the number “1”. This is the second number of the lock combination. C: There is a Kyosha piece to the left and a Hisha piece to the right. Trace each of them like before and together they make a “4”. This is the third number for the lock. D: There’s a Kyosha piece to the left and two Hisha pieces to the right. If you trace their paths, you get “9.” Now you have the fourth number. 13. Go back to the locked cup and punch in “7149” to unlock it. Take the cup. 14. Go to the sink and turn the right handle to get the water running. Use the cup with the eater to fill it. 15. Put the screwdriver shaft into the cup of water. We’re going to freeze it and make a working screwdriver! 16. Go to the fridge and open it. In the upper right corner is a little switch. Change it from “Refrigerator” to “Freezer”. Put the cup in and zoom out. Look around the room a bit and when you come back the water will be frozen. Take it out of the freezer. 17. Tap on the cup. It says it’s stuck. Go to the sink and turn on the water. Use the cup on the running water and you’ll get a frozen screwdriver (sorry, not the drink!). 18. Now that you have a screwdriver, go to the desk and turn the clock around. Use the screwdriver on the back and take out the batteries. 19. Zoom in in the “Osho” piece you have in your bag. Turn it over and there’s a screw there. Use the screwdriver to open it and turn the piece into a key! 20. Next to the clock, zoom in on the space between the wall and the desk. There’s a die wedged in there. Use the screwdriver to get it out. 21. If you look behind the desk, there’s something stuck there. Zoom back out once and tap the desk to move it. Now you can take the USB cord. 22. Now you can also access the drawer right below the computer. Open it and take the blow-dryer from it. 23. Plug the blow-dryer into the outlet behind the desk. 24. Zoom in on the die in tour back. Tap on the red dot and it starts to come off a little. It’s a sticker. Use the die on the blow-dryer, and the sticker comes off. It reveals a keyhole. Use the Osho key on it. Now you have another key! C: We already know this from before — it’s 4. A: We know this, too — it’s 7. E: Rememer the kerchief we put on the table? Let’s go take a look at that. The piece we have on there is a “Kaku” piece. If you look at the blackboard, this piece moves diagonally. If you trace its path, it makes an “X”. You can now take back the Kaku piece and kerchief. Since we need four letters for the lock, we’ll make it 0329. 26. Go to the cabinet below the globe and punch in the numbers 0329. Press ENTER and it opens. Take out the skull. 27. Zoom in on the skull. There’s a small screw holding the jaw on. Use the screwdriver to loosen it. Now the jaw has fallen off! 28. Zoom in on the globe. Unhinge the wooden piece on the top. Then turn the globe around so it shows the two circles that look like eyes. Place the skull on the globe so the eyes match up with the two circles. Turn the skull around to the back and you’ll see a hole. Insert the key you have to unlock it. Now you can take the skull off the globe. Open the globe and take the digital camera from inside. 29. Co to the room with the game boards on tables. Zoom in on the window. Place the handkerchief on the window. Zoom in on it and you’ll see some red drawings. Use the glass shard on any “X” and all three will be cut away. Make sure to tap on the letter “F” before leaving the screen, so the game registers that you saw the clue. 30. Go to the computer and attach the USB cable. Then attach the digital camera to the cable. 31. Turn on the computer and open up the “door_pass” file. It tells you that the code to the front door is “DAEF”. We know all the letters except F, but now we have access to the “F” file. 32. So open the “F” file. Use the handkerchief on the screen. It now highlights three tiles for you. Here is where the game gets a bit ridiculous. You have a Kyosha piece at the bottom, which goes straight up, forming a ” “1”. Then you have a Kin piece and a Hisha piece at the top. The Hisha piece forms a “7” like before. But the Kin piece goes in six directions, so it doesn’t really seem to fit in here. All you need is the 1 and 7, to make 17. 33. Now back to the door code: DAEF. We have all the numbers now: 97X17 = 1649. 34. Go to the combination lock next to the front door and enter “1649”. Press ENTER and then open the door! If you liked this game, make sure to try out Escape Game: “An Odd Game”, Escape Game: “An Uninspired Man” and Closed Room. Previous PostDark Meadow: Game Review: Is it more than just a re-skinned Infinity Blade? 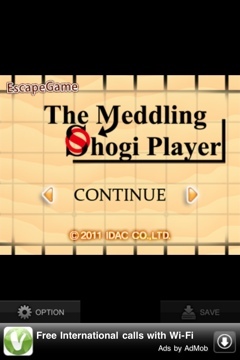 Next PostEscape Game: “The Meddling Shogi Player”: A challenging, but ultimately satisfying room escape game. It’s a little piece of tape. does the piece of tape have marks/symbols/lines on it? You’ve created an astonishingly thought-provoking post. Your written content speaks to me personally and I share inside your views. numerous authors don’t create unique material, but you have truly accomplished a amazing work with this particular information. where do i find the battery?? I can’t use handkerchief on screen :/ what did i do wrong? The water won’t freeze when I put it I. The freezer! !